On December 4th 2006, PFC Ross A. McGinnis, 1St Platoon, C Company, 1St Battalion, 26Th Infantry Regiment, 2Nd Brigade Combat Team, 1St Infantry Division, 2Nd Bct, 2Id, purposefully gave his life to save four others. On patrol in the Adhamiyah area of Baghdad, he was in the humvee gunner’s seat when an insurgent perfectly lobbed a grenade past him into the vehicle. It landed below him on the floor. He immediately yelled “Grenade…it’s in the truck.” PFC McGinnis could have gone right up out of his seat exiting the vehicle. He made a different choice as he looked at his fellow-soldiers crouched in the corners, on the edges, as far as one can get from a grenade in a humvee. He chose their lives over his own. He climbed down, covered the grenade and took the full explosive force, suffered the entire violence in his own body, absorbed the pain, suffering and punishment himself that was intended for others. Those facts are true. He was a soldier that gave the ultimate sacrifice for his fellow soldiers. PFC McGinnis is an American hero. None of these four soldiers would ever do such a thing. The soldiers would be ignoring PFC Ross McGinnis’ self-sacrificial act; the fact that he thought about what he was going to do and what would happen; the fact that he chose specifically to make the ultimate sacrifice for his fellow soldiers instead of fleeing. This was a conscious volitional act, done without hesitation or judgment. 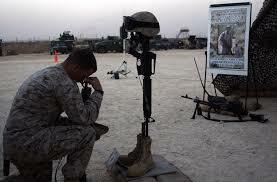 Not a single soldier would even contemplate such a disrespectful thing. They would with the utmost respect, deepest emotions and strongest passion thank Mr. and Mrs. McGinnis for their son. Any person whose life was saved by another wants to honor that sacrifice, that choice. That makes sense. How many say, “I believe in God.” How many of those deny Jesus Christ? How many believe they have to work, or do something to earn eternal life? How many think they have to work off their sins in some fashion, in some holding area between this life and the next? How many more claim to believe in the Father or the Son but never consider worship a priority, preferring sports, entertainment, sleeping-in or getting things done around the house? Ross McGinnis gave the last full measure of devotion for four lives on earth. Jesus gave the last full measure of devotion for every life eternally in heaven. How does God react when we deny His Son’s sacrifice, when we do not utter the name Jesus, when we want to use politically correct speech and generally say, “I believe in God” instead of saying, “I believe in Jesus.” God the Father does not want recognition for what His Son did on the cross for you. If you respect that sacrificial gift, you will honor it properly. Anything else is tantamount to claiming the sacrifice was an entitlement. Like Ross, Jesus was already a hero to the Father before He left Heaven because He chose to give His life for the love that eternal life represents. If you have to work to enter Heaven in any way, you make Christ’s sacrifice empty. Ritualistic worship, confession, prayer, praying to anyone or anything besides the Son of God is offensive to the Father. How often do you tell the Father His Son’s sacrifice was not enough, or that you do not recognize Jesus’ death on the cross, or that entertainment and personal desires are more important? To PFC Ross McGinnis for making the ultimate sacrifice and embodying, as our Savior modeled for you, “Greater love hath no man than this, that a man lay down his life for his friends.” We salute you sir. To the Sgt 1st Class Thomas, 1st Sgt Hendrix, PFC’s Beck and Blair in the humvee that day. Thank you for your service. Let PFC McGinnis continue to honor others through your selflessness. Continue to serve your country with honor, your communities with integrity, your families with virtue and Christlike character and you will honor McGinnis’s sacrifice. To Mr. and Mrs. McGinnis. Thank you for your son and the selfless heart you cultivated in his breast. Few men give themselves to save one life, your son saved four.